Christ Lutheran Church has made a commitment with Thrivent Builds® with Habitat for Humanity® to build a Habitat house in Staunton for the Rodriquez family. Christ Lutheran has not only made a monetary pledge toward the build but also work days. Members of the congregation will help build the house and other members will provide lunch for the workers on our work days. 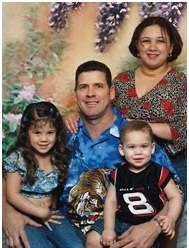 Hello, we are a Cuban family who came to America as refugees. America to us is a land of opportunity where we can fulfill our dreams. My wife and daughter came 19 months before I came to America. My son Yaniel was born in America and he is 1 year old now. I worked very hard to provide a stable home for my family and to prepare to one day own a home of our own. That was when I had a very serious accident at work that could have been fatal. I injured my back at 3 vertebras’ – and now even after surgery and recovery I am left with a disability of having to walk with much dependence on a cane and left with great pain that makes it impossible to stand very long. I am very grateful to God that that our family’s life is now heading in another direction. I despaired of ever having a home for my family because we simply could not afford one. God has opened this door to us through the good organization, Habitat for Humanity. It is indeed a blessing that there is such a thing to provide homes for people who need them. Our family would never have been able to achieve this dream without them. I am grateful with all my heart that God allows that there are people like those who work with Habitat to provide affordable housing to families like mine.